Here's a Sunday afternoon workout for you! (Thanks to Kristal - the leader of boot camp - for providing this workout.) My husband and I did this workout today - it was definitely not an easy game. All you need is a deck of cards and a little space. 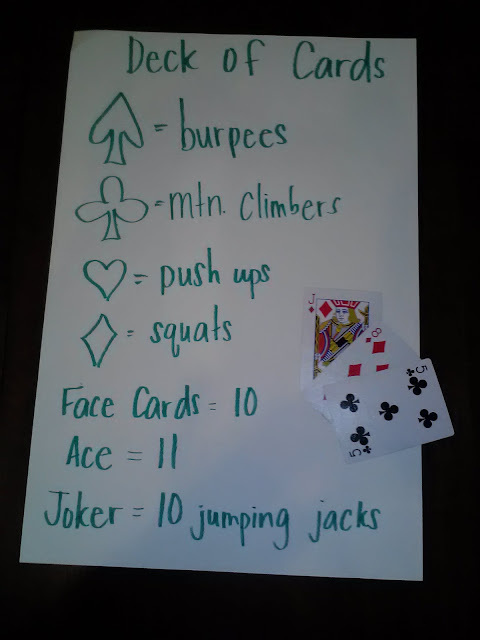 Face cards = 10 reps.
Ex: Drawing a 2 of hearts = 2 push ups. Drawing a jack of spades = 10 burpees. As soon as you finish one card, turn over the next card or get someone to turn them over for you. I don't know about you, but when I'm in the middle of a workout, my brain doesn't work - so I suggest writing out a chart or writing it out on dry erase to refer to you as turn over cards. You can adapt the workout to fit your needs. Exchange something for sit-ups or jumping jacks. Turn up your music and keep going! There's an app for that! Try RipDeck, a deck of cards iPhone workout app. Let us know your fav exercises to do with it and we may feature your custom workout and blog on our In-App News, Facebook and Twitter.